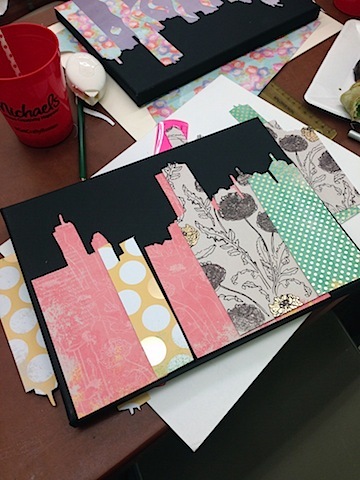 Much to my husband’s dismay, I could spend all day wandering around a Michaels store. However, the reason is twofold. YES, it’s partly because there’s so much to look at and I want to buy everything. And glitter. So much glitter. Martha Stewart glitter, at that. But it’s also because it’s always been a bit tough to find exactly what I’m looking for at Michaels. If I’m with Chris, we generally get to a point where he says “Can we please just ask someone for help? !” And then begins the process of looking for someone who works at Michaels. I never really want to ask for help because I secretly like that I have an excuse to wander around looking at everything. 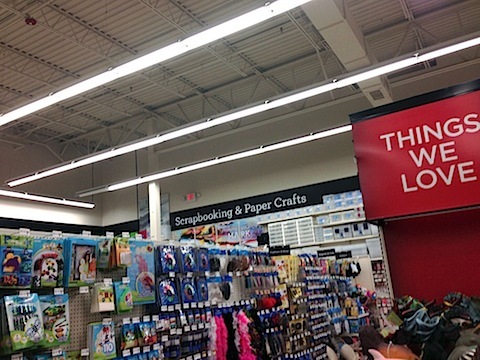 However, in Boston stores, my excuse is now gone because Michaels stores just underwent a big makeover. You may have noticed, I don’t attend half the amount events for the blog that I did once upon a time. 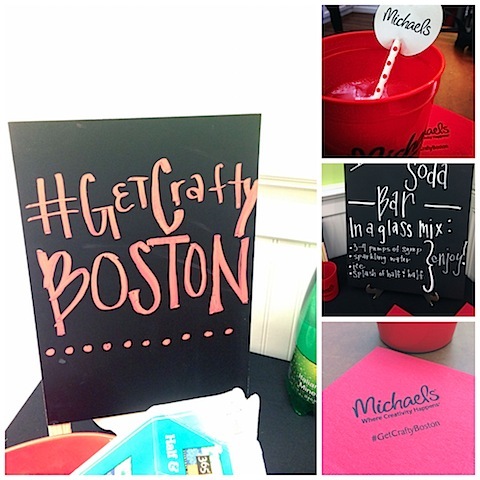 But when Michaels invited me to an event the other evening, I was not about to turn it down. 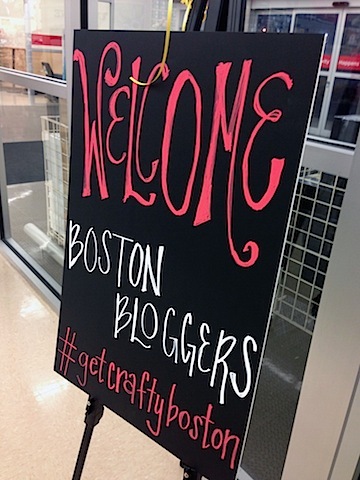 They had just redone a majority of their Boston stores and had invited me in for a tour and crafting fun. I headed to the Saugus location on Thursday night to check it out. P.S. How have I lived in my apartment for almost two years and never realized how close I am to this particular Michaels?? Also, though the store is on Route 1 (my personal nightmare), I don’t actually have to drive on Route 1 to get there. Unless I take 15 wrong turns on the way. Which I may have done the other night. When I first arrived, we went into the Michaels classroom (which, by the way, anyone can rent out!) and had some food and Italian sodas. Then we got started on a crafting project. Those who know me know I am not the craftiest girl in the world. But I do dream of being crafty. And believe it or not, one of my most popular posts on We are not Martha IS a crafting project (my glitter flats!). I got about halfway done with my Boston skyline canvas before running out of time. Also, please kindly ignore the fact that the skyline is backwards. Then it was time for a tour of the new store. 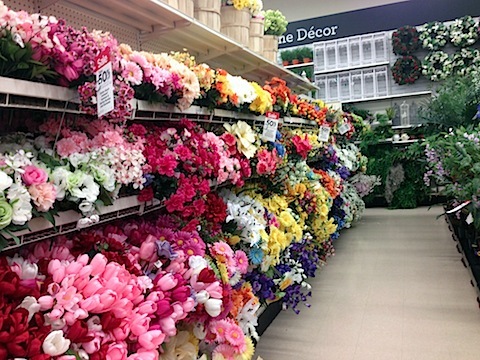 If you’re a regular Michaels shopper, you’ll immediately notice the change when you walk in. It’s much more open and a whole lot brighter. Plus? You can look up and easily see what products are in different areas of the store. This is going to be hugely helpful in navigating the store! 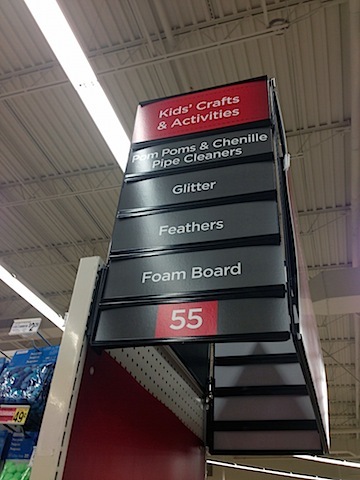 There are end caps on the aisles describing what’s in each aisle and some of the best news of all? The aisles are wider! There’s just more room to navigate the store and it makes for a much more pleasant shopping experience. But if you can’t find what you’re looking for, you’ll have a much easier time finding an associate as they’ll all be wearing red. Guys, I was in Wilton heaven here. Despite all the fun Wilton stuff I’ve received over the last couple months, there’s still SO much more. I don’t understand how they make so many products that I somehow feel like I need. 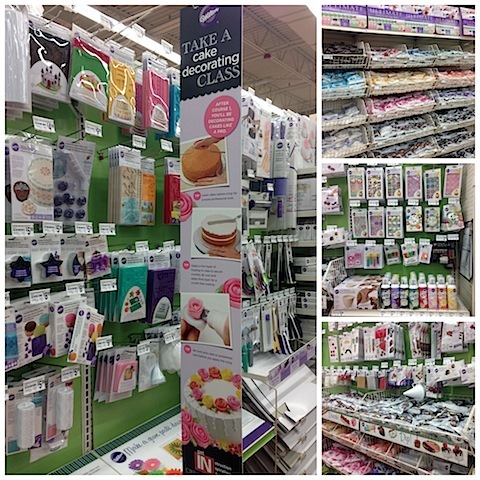 Also, I desperately want to take a Wilton decorating class at Michaels. Anyone want to join me?? 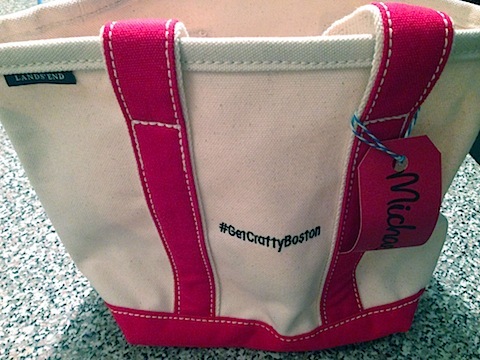 Michaels gave me a super cute little tote with a nice gift card to take home. Now, I need to come up with my next crafting endeavor. Chris and I are still house-hunting, but whenever we find our new home (le sigh to this process), I’m planning on getting all sorts of DIY-y. Watch out, Michaels, I’m coming for you. Not to mention, Pinterest. The other totally awesome news is that Michaels has also launched their ecommerce website. Now I can go to Michaels at 3 a.m. in my pajamas. No Route 1 involved. Talk about easy navigation! Boston is being used as a sort of test market for this new design and 27 Boston-area stores are unveiling this new look. I feel like Boston NEVER gets things first (though we are getting a Primark first! 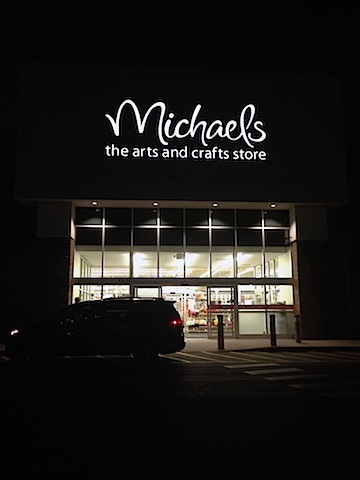 ), so I’m kind of honored Michaels chose our market. Tomorrow, Sunday, May 4, all of these 27 Boston-area stores are going to be unveiling their new look with a grand re-opening celebration. If you’re interested in attending, there will be a ribbon cutting ceremony at 9:45 a.m., with doors opening at 10 a.m. and lots of fun chances to win! Do you likes to get crafty? If there’s glitter, I am so in! Michaels did give me a gift card for attending this event, but of course, all opinions are 100% my own! 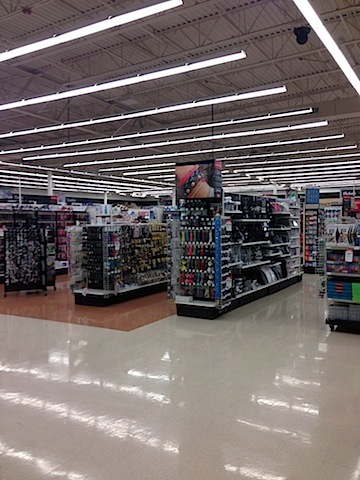 8 Responses to "A New Look for Michaels Stores"
I miss Primark! I wonder if New Englanders will like it? How cool! Michaels is heaven on earth for me!!! Sounded like a great event. Loved the Tote Bag! I was so bummed I had to miss this event! But can’t wait to check out the stores in person!! I get caught in Michael’s too. Luckily mine is 1.5 hrs away. However I am planning to go in the next couple of weeks. I wonder if the Washington state stores have changed. The improvements you mentioned sounds great. I like wandering around, but sometimes I want to just find it already. I LOVE Michael’s, and we live dangerously close to the Porter Square store. We actually got a lot of stuff for our wedding through Michael’s bulk section, and they were so great to work with! I love the new look! I always felt like it was kind of cluttered feeling. The openness is more inviting. And you and I have the same tactics. Jeff always tries to find someone to help us while I keep wandering up and down all the aisles. There might be things there that I didn’t know I needed! I could so live in a Michaels and never leave. It does get overwhelming but I guess in a good way. Excited to see the new look!! !